Overview of the Hellboy slot. There’s just no mistaking Hellboy, one of the top names of the comic book world. This Dark Horse comics character really stands out thanks to an iconic design; a rough and ready demon with red skin and a trench coat, plus that huge stone fist! 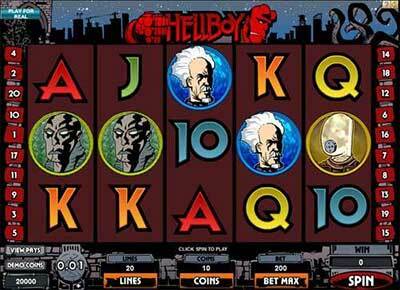 With two major feature movies and a long comic history, Hellboy was a smart choice for a themed slot game. This slot was developed by Microgaming, a company with some very strong titles out there. This is a 5-reel slot with animated symbols and two features, plus it features Hellboy’s supporting cast of characters. This may not be the prettiest comic slot out there, but it uses a 2D cartoon style which is very true to the feel of the comics. On top of that you have bonus rounds themed on Hellboy’s personal story arcs. Let’s look at this famous character and the game in more detail. This is one of the biggest comic book characters out there, though this Dark Horse comic does struggle for attention sometimes against the giants of Marvel and DC. Hellboy is a demon, hence the red skin, horns and hooves, who was summoned to earth by the Nazis to turn the tide of war. The Allies prevented this and Hellboy was taken in by Professor Trevor Bruttenholm and raised as a human child. This loving attention caused him to grow into a hero rather than a typical demon. Hellboy is gifted with demonic strength, endurance and rapid healing. He also has the iconic stone fist, known as the Right Hand of Doom, which is an ancient artefact that could unleash Ragnarok on earth. Hellboy is also famed for a crazy cast of supporting characters who also star in the slot game, as symbols. These characters have been seen in the two major Hellboy movies, released in 2004 and 2008, starring Ron Perlman as the title character. This slot may not look as polished as other comic book slots at first, but Microgaming have cleverly opted for thick drawn lines and a slightly rough and ready appearance which actually matches the grungy feel of the original Hellboy comics. So, while this slot does not look like the movies, it does look right and has the signature Hellboy logo too. The symbols for the various characters animate when they land a win. There are five character symbols, including Abe Sapien the amphibian humanoid, Liz Sherman with her pyrokinetic powers, Professor Bruttenholm, Johann Kraus who exists as a spirit in a suit and finally Hellboy. They capture the looks of these characters well. The Underworld bonus round also looks very cool, showing you Hellboy on a mission through rocky caverns with dangerous enemies. This feature is a welcome addition as it means you get to see our hero in action, with a little interactivity. Wins pay left to right here but the scatter symbol has the power to go right to left, giving the game a bit of a twist. This is a 5-reel game with 20 paylines which you can see down the sides of the reels. Betting max will pick them all but this does increase your bet by 20 times. A handy feature of this slot is that you can click any symbol to see its value. Hellboy is the top scorer of the characters, but you can also grab the logo which is a wild and doubles in value for a huge payout. The Right Hand of Doom symbol is the scatter and landing 3 or more will trigger the Underworld bonus. The slot has two feature rounds, the Underworld bonus and the Supermode bonus. The Underworld is where you get to see Hellboy in action, on a mission to secure the hidden relic of power, guarded by ferocious beasts. You travel through four levels, earning prizes as you defeat beasts, hoping to find team members who award all prizes for the level. If you choose your route poorly and hit a dead end, the bonus is over. Supermode is a secondary bonus, randomly triggered at any time to award 10 free spins, with three wilds on the reels.